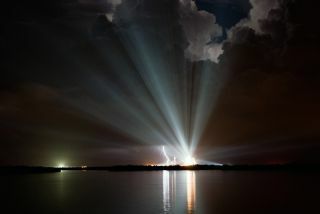 Xenon lights over Launch Pad 39A at NASA's Kennedy Space Center in Florida compete with the lightning strike seen to the left as the space shuttle Discovery is on the pad waiting for a scheduled liftoff on the STS-128 mission on Aug. 25, 2009. Stormy weather delayed the launch by one day. CAPECANAVERAL, Fla. ? NASA is now targeting no earlier than Friday to try to loftthe space shuttle Discovery after a critical valve failed a standard checkduring its second launch attempt earlier today. MikeMoses, head of Discovery?s mission management team, told reporters here atNASA?s Kennedy Space Center that engineers will begin studying the valvefailure on Wednesday and decide Thursday whether to aim for a weekendlaunch or stand down for lengthy repairs. Theshuttle was slated to launch early Wednesday at 1:10 a.m. EDT (0510 GMT) tosend seven astronauts to the International Space Station on a 13-day constructionflight. The mission has already been delayed a day due to stormy weatherhere at NASA?s Kennedy Space Center early Tuesday. Thevital drain valve is part of a system used to fill and drain Discovery?s15-story external tank with super-cold liquid hydrogen propellant by routing itthrough the aft section of the orbiter. The shuttle has a similar valve for itsliquid oxygen supply and both must function perfectly in order to launch. Whilefueling Discovery?s tank today, the hydrogen valve failed to indicate it wasclosed when launch controllers sent it a test command. NASA engineers areunsure whether the glitch is an instrumentation error or a sign of somethingmore serious - like wear damage to the valve that would require it to bereplaced. If it does have to be swapped out, there may not be enough time tomake the switch and still try to launch by Aug. 30, when NASA?s window tolaunch Discovery?s mission closes. ?It?snot a guarantee, but we?re probably not going to make it,? Moses said of thepotential repair. Alsomuddying Discovery?s chances for launch is a slight hydrogen leak thatengineers detected after today?s cancelled launch attempt. The leak was wellbelow NASA?s safety limits but mission management opted to check it out anywaysince it is near the location of the faulty drain valve. ?Prudencedoes dictate that we take a look at it,? said Pete Nickolenko, NASA?s launchdirector. Mosessaid that mission managers plan to meet Thursday afternoon to take stock of thehydrogen valve troubleshooting work and decide whether to push toward a Fridaylaunch. Discoveryactually has two chances to launch on Friday. The first is at 12:22 a.m. EDT(0422 GMT) and would require NASA to begin fueling Discovery?s external tanklate Thursday for the attempt. The other is late in the evening at 11:59 p.m.EDT (0359 Aug. 29 GMT), with fueling beginning earlier that day. NASAhas until Aug. 30 to launch Discovery before standing down due to a conflictwith another operation on the launch range it shares with the nearby CapeCanaveral Air Force Station. Thespace agency wants to launch the shuttle mission before the end of August inorder to avoid space traffic conflicts with Japan?s first unmanned space cargoship and a Russian crew-carrying Soyuz spacecraft, both of which are also setto fly to the International Space Station in September. IfDiscovery does not launch by Aug. 30, NASA?s next opportunity will come Oct.17, mission managers have said. Commandedby veteran spaceflyer Rick Sturckow, Discovery?s six-man, one-woman crew plansto deliver nearly 8 tons of food, equipment and science gear to theInternational Space Station. The astronauts plan to replace one member of thestation?s six-person crew and deliver a new treadmill named after televisioncomedian Stephen Colbert. Threespacewalks are also planned for the mission. Discovery?s flight will markNASA?s fourth shuttle mission of the year and the second to launch at night. Discovery?sastronaut crew will likely have some time off over the next two days asengineers try to fix what?s wrong with their ailing spaceship. ?Badluck again, but maybe we can have dinner with the families,? said Swedishastronaut Christer Fuglesang, a Discovery mission specialist, in a Twitterupdate. New Video - Stephen Colbert to NASA: ?No Chubby Astronauts? SPACE.comis providing complete coverage of Discovery's STS-128 mission to theInternational Space Station with Managing Editor Tariq Malik in Cape Canaveral,Fla., and Staff Writer Clara Moskowitz in New York. Click here for shuttle missionupdates and a link to NASA TV.